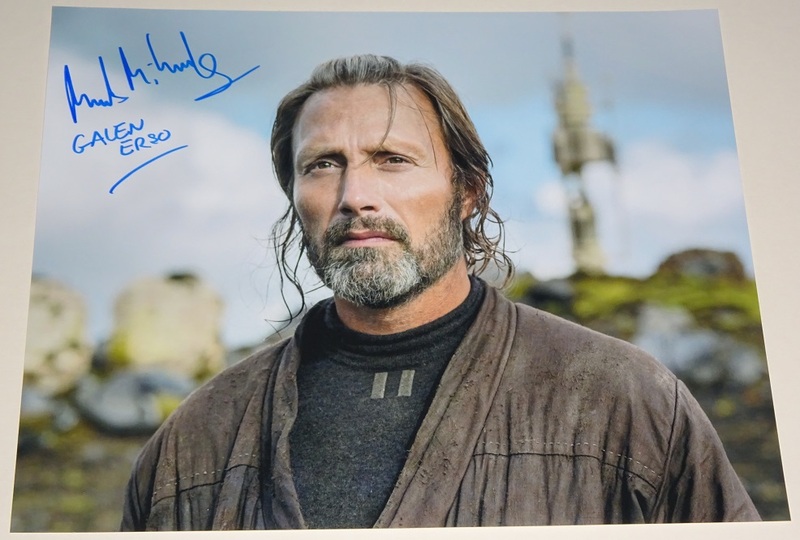 "You're confusing peace with terror.."
This great 11x14 of Galen Erso from Rogue One has been signed by Mads Mikkelsen who played the role. Mads is also famous for playing notorious Hannibal Lecter in the Hannibal tv series and also villainous LeChiffre in Casino Royale. In Rogue One all looks lost for the Rebellion against the Empire as they learn of the existence of a new super weapon, the Death Star. Once a possible weakness in its construction is uncovered, the Rebel Alliance must set out on a desperate mission to steal the plans for the Death Star. The future of the entire galaxy now rests upon its success....The purchaser will receive full details of where and when Mads signed this piece. Galen Walton Erso was a human male scientist and leading galactic authority on crystallography and energy enrichment. Born on the planet Grange, an agricultural backwater world, Erso was drafted into the Republic Futures Program, where his skill and intelligence ultimately led him to becoming a critical, if reluctant, component in the development of the DS-1 platform. In doing so, Erso managed to subtly sabotage its design in a way that ultimately proved disastrous for the Galactic Empire. One of the most renowned polymaths in the galaxy, Galen was a gifted theoretician, mathematician, and experimental physicist. Galen was a recipient of the Kuat Systems Engineering Medal, the Ashgad Prize and the Roche Foundation Prize.